As you know Realme has released it's next Android smartphone Realme 2 RMX 1805 with 3 GB RAM and 32 GB ROM and it's runs on Qualcomm platform with Android latest version 8.1 Oreo. The phone has Qualcomm Snapdragon 450 Octa Core 1.8 GHz Processor with a Mobile Battery Capacity of 4230 mAh, along with below key features. 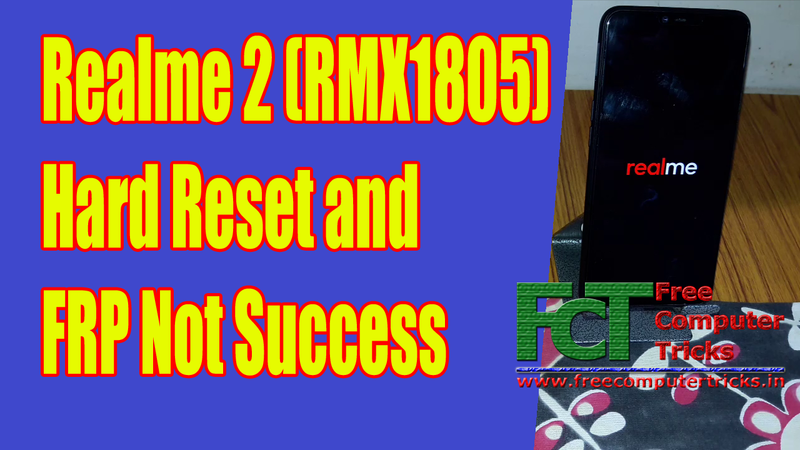 Realme 2 (RMX1805) Hard Reset and FRP Not Success? You can boot the phone to Android recovery but when you chose wipe data or factory reset it will ask to enter the pattern lock or password of the phone used. So it's difficult to hard reset or unlock pattern or password of the phone. If you need to hard reset the phone you can search the flash file of Realme 2 to flash the phone using msm download tool. If you need to bypass, remove or unlock Factory Reset Protection of the Realme 2 Android phone, then in the same way you can try to flash the phone or you can try other Qualcomm Android 8.1 FRP bypass procedure available on YouTube. Sir realme 2 passcode unlock prosses please told me.